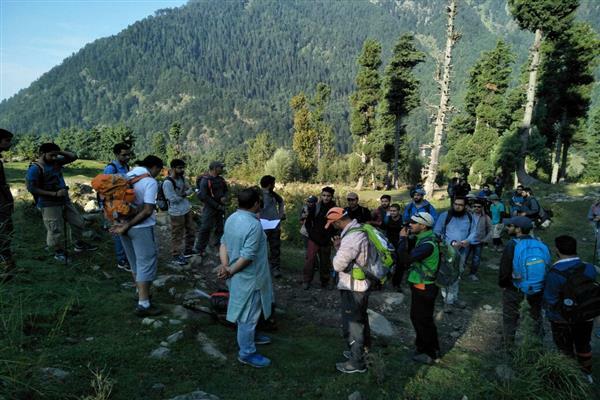 Pahalgam, Sep 10 (KNS): Environmental activist, Mushtaq Pahalgami Sunday flagged off the second batch of trekkers bound for Tulain Lake via Chothal Valley, at 8am this morning. The trekking expedition is part of a series of treks organised By Himalayan Welfare Organization-HWO in collaboration with directorate tourism kashmir and JKHMC, the Himalayan Welfare Organization, founded by Pahalgami in 2008, to inculcate environmental social responsibility and a sense of moral social duty among the youth. The treks are what can be called 'green treks' or 'Social Treks', a new concept in trekking, leaving a minimal carbon footprint and have a low environmental impact. They are also made aware of the dangers of environmental pollution on the way, and are encouraged to collect and bring back litter and garbage from the ecologically sensitive trekking destinations.